The San Antonio Police Officer's Association (SAPOA) held its 17th Annual Benefit Fund SA Awards Banquet @ the Crowne Plaza Hotel downtown, Tuesday, Septebmber 30th. KENS-5 Anchorwoman Sarah Lucero emcee the program & former State Senator & State Comptroller John Sharp served as Keynote Speaker. On this day of Rosh Hashanah (Jewish New Year) the term "Half-Jewish" is still debated by many. Some people use the term "half-Jewish" to describe a person who has one Jewish parent and one non-Jewish parent. The use of the term is regarded as controversial. The term has no significance as a religious category. While the various Jewish denominations have different rules which determine the status of children of mixed unions, all versions of these rules agree that a person is either Jewish or not. As a result, many Jews reject the use of the term "half-Jewish," some maintaining that it has historical racial connotations. Most people who use the term are unaware of the racial connotations of the term, and the anguish it causes to some Jews aware of the connection. Others use the term to imply that Jewishness is more of a cultural or ethnic identity than a religious one. People of mixed heritage may not fully identify as Jewish, regardless of whether they embrace Judaism as a religion. In the United States, because of intermarriage, the population of "half-Jews" is beginning to rival that of Jews with two Jewish parents, especially among young children. "Half-Jewish" is said to be emerging as an independent identity with its own traits of tolerance and adaptation, but also perhaps a sense of detachment, spiritual indifference, or unclear identity. Other similar terms that have been used include: "part-Jewish" and "partial-Jews". The term "Gershom", "Gershomi" or "Beta Gershom" has also been used as an alternative to "half-Jewish" and "part-Jewish" in connection with descendants of intermarriage, Gershom being the son of Moses and his Midianite wife Zipporah. Most people would describe themselves simply as "my father/mother is/was Jewish", which has no implication as to their own Jewish status. Editor's Note: On this day of Rosh Hashanah, Walker Report Publisher & Justice of the Peace, Pct. 2 candidate & former Balcones Heights Councilman Steve Walker says, "my deceased father was Jewish. He changed his name from Ginsburg to Walker during WWII before I was born. I am proud of my lineage that includes Rabbis on my father's side & Catholic Priests on my mother's side." Rosh Hashanah is the "head of the year," is a Jewish holiday commonly referred to as the "Jewish New Year." It is observed on the first day of Tishrei, the seventh month of the Hebrew calendar as ordained in the Torah, in Leviticus 23:24. It is the new year for people, animals, and legal contracts. The Mishnah also sets this day aside as the new year for calculating calendar years and sabbatical (shmita) and jubilee (yovel) years. Rosh Hashanah commemorates the creation of man whereas five days earlier, on 25 of Elul, marks the first day of creation. The Mishnah, the core text of Judaism's oral Torah, contains the first known reference to Rosh Hashana as the "day of judgment." In the Talmud tractate on Rosh Hashanah it states that three books of account are opened on Rosh Hashanah , wherein the fate of the wicked, the righteous, and those of an intermediate class are recorded. The names of the righteous are immediately inscribed in the book of life, and they are sealed "to live." The middle class are allowed a respite of ten days, until Yom Kippur, to repent and become righteous; the wicked are "blotted out of the book of the living." Rosh Hashanah is observed as a day of rest (Leviticus 23:24) and the activities prohibited on Shabbat are also prohibited on Rosh Hashanah. Rosh Hashanah is characterized by the blowing of the shofar, a trumpet made from a ram's horn, intended to awaken the listener from his or her "slumber" and alert them to the coming judgment. There are a number of additions to the regular Jewish service, most notably an extended repetition of the Amidah prayer for both Shacharit and Mussaf. The traditional Hebrew greeting on Rosh Hashanah is "shana tova", (pronounced [ʃaˈna toˈva]) for "a good year," or "shana tova umetukah" for "a good and sweet year." Because Jews are being judged by God for the coming year, a longer greeting translates as "may you be written and sealed for a good year." (ketiva ve-chatima tovah). During the afternoon of the first day the practice of tashlikh is observed, in which prayers are recited near natural flowing water, and one's sins are symbolically cast into the water. Many also have the custom to throw bread or pebbles into the water, to symbolize the "casting off" of sins. Hispanic Chamber Awards, 6 p.m. Tuesday, September 30th @ the Pearl Stable, Pearl Stable Parkway #2 for the 2008 General Motors Inspire Awards presented by The San Antonio Hispanic Chamber of Commerce. Obama Blue Day, Tuesday September 30th, everyone is asked to do two things: 1) Wear Blue 2) Register Two voters! Fundraising reception honoring District 119 State Representative Roland Gutierrez,Tuesday, September 30th, 5:30 p.m. - 7:30 p.m. @ Club Giraud located at 707 N. St. Mary's St.
Tuesday, September 30th • 5:30 to 7 p.m. Please join us for a fundraising reception honoring Wallace Jefferson, Chief Justice of the Texas Supreme Court. 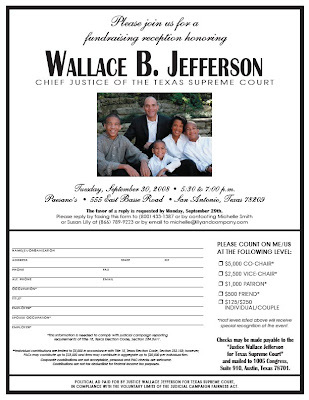 Checks may be made payable to the “Justice Wallace Jefferson for Texas Supreme Court” and mailed to 1005 Congress, Suite 910, Austin, Texas 78701. Join us for a community rally organized and led by San Antonio women leaders of all ages featuring State Senator Leticia Van de Putte, State Rep. Ruth Jones McClendon, former Councilwoman Maria Antonia Berriozabal, former Councilwoman Patti Radle and DNC Member, Choco Meza. Join Congressman Charlie Gonzalez, Congressman Ciro Rodriguez, State Senator Leticia Van de Putte and State Senator Carlos Uresti as they support and recognize our wounded warriors. Meet at the alamObama Office, 301 Broadway, Suite #106, corner of 3rd & Broadway. Help us in our final push to register as many new voters as possible before the October 6th deadline! Obama volunteers will gather at the alamObama office for a city-wide voter registration drive and early voting awareness day. The Benefit Fund of the San Antonio Police Officers’ Association has served the San Antonio community for over 30 years by providing much needed support and assistance to children that suffer from special needs and many forms of neglect and abuse. In an attempt to raise funds, we host an annual event to honor and recognize those in our community that have directly affected the lives of these children and the City of San Antonio.17th Annual San Antonio Awards Banquet Honor our heroes With Special guest Speaker, former State Texas Senator and Comptroller, Currently Texas Tax Reform Commission Chairman John Sharp. Emcee KENS 5 anchor Sarah Lucero. Dinner and Awards presentation 7-9 p.m.
6 p.m. Tuesday, September 30th @ the Pearl Stable, Pearl Stable Parkway #2 for the 2008 General Motors Inspire Awards presented by The San Antonio Hispanic Chamber of Commerce. 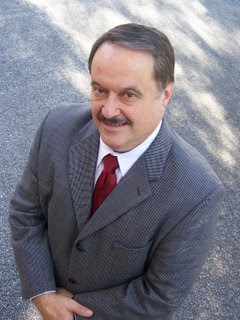 Also, in honor of the late Dr. Keith Russell, a special presentation will be presented for his work as Dean of the Bill Greehey School of Business at St. Mary’s University, and will be accepted by Dr. Charles L. Cotrell, president, St. Mary’s University. San Antonio Association of Hispanic Journalists (SAAHJ) Member Martha Tijerina will be traveling to Washington, D.C. this week to receive the 2008 MANA Las Primeras Award for Communications. Tijerina, known as the ‘First Lady of Spanish Television’ was selected for her contribution to the television broadcasting industry, serving as the first Latina Director of Public Affairs to host a Spanish language talk show covering Latino issues in the United States. For 19 years, the one-hour talk show “En San Antonio” aired on KWEX-TV, the first television station of the first Spanish language Television Network in the United States, Spanish International Network (SIN), which later became Univision Communications, Inc. The show focused on spotlighting community issues and helping to improve the lives of the viewing public. The presentation will take place at the 19th Annual Las Primeras Awards Gala at 6:30 p.m. on Thursday, Oct. 2nd in the Organization of American States Hall of the Americas, 17th Street and Constitution Avenue, N.W., Washington D.C. Joining Tijerina in the celebration will be her first boss Emilio Nicolas, Sr., the pioneer of Spanish Language Television in the United States and former chairman of the Spanish International Communications Corporation (SIN) and his wife, Mrs. Irma Nicolas. 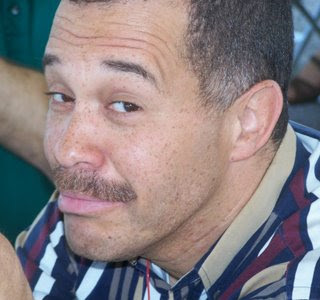 “Marthita was there at the beginning with us in our efforts to better our community and her deep dedication to our viewers is still felt today,” said Nicolas. Her list of awards include an induction into the San Antonio Women’s Hall of Fame in the field of Communications, the 2007 La Prensa Foundation Media Award for Outstanding Women in Action, the Association for Women in Communications Headliner Award, the 2007 Benitia Humanitarian Award and the Centro Cultural Aztlan’s Humanitarian Award. 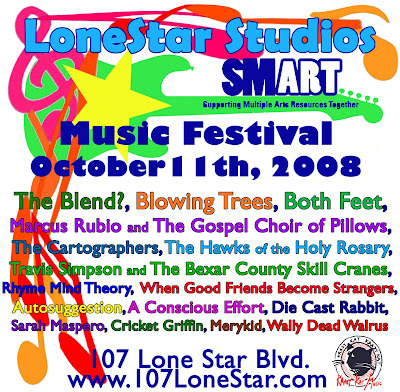 Music Festival, Oct. 11th @ Lone Star Studios, 107 Lone Star Boulevard. Watch out! The Alamo hosts a competition of members from the International Knife Throwers Hall of Fame on Saturday, October 4th. Matches begin at 10 a.m. on the grounds behind the Shrine and run throughout the day. The public is invited to watch and to question contestants on techniques. In addition, living history, book signings, and live music will take place. Please note: Arrangements can be made prior to the event for print, radio and television appearances. This is a visually stunning event and would do well with print images and video. The Alamo, known as the Shrine of Texas Liberty, is located in downtown San Antonio . It is free and open to the public. The Alamo has been managed by the Daughters of the Republic of Texas for over 100 years. Trinity University student group Latino Exchange invites the entire San Antonio community to Floricanto: A Celebration of the Written and Spoken Word. This year Floricanto features the work of novelist and journalist Barbara Renaud Gonzalez and poet and critic Pablo Miguel Martínez. The free event takes place on Thursday, October 2nd at 7 p.m. in the Chapman Auditorium. For more information, contact Dr. Michael Soto at (210) 999-7561 or michael.soto@trinity.edu. Shavano Park to host its 10th mixer, October 1st. Click link for more details. San Antonio Asian Community Affairs is having a fundraising event on Tuesday October 21st, from 6-9 p.m. Tickets for sale at $30 per person. Includes drinks and great Chinese food. Henry Brun & the Latin Playerz Trio will be playing throughout the evening. The event will be held at the Fire Wok patio. San Antonio Asian Community Affairs (SAACA) was founded in 2000 as a Texas non-profit organization. SAACA’s Mission is: To improve the well-being and quality of life for Asians and Asian Americans by acting as a liaison between the Asian Community and the local government to provide information and assist in other areas. In the past SAACA has raised $80,000 to purchase 500 gas masks for the San Antonio Police Department, and 500 gas mask canisters to the San Antonio Fire Department. SAACA is hoping to raise enough money to build a one stop website to link up all the Asian organizations in San Antonio and provide access to the community. Also SAACA would like to establish an emergency response team to provide emergency translation and assistance to the community. On this day San Antonio Asian Community Affairs is Honoring Judge Peter Sakai for “Asian Community Leader Award” and we are also celebrating Judge Sakai’s birthday. SAACA /P.O. Box 29825 San Antonio, Tx 78229. Homeowner Taxpayer Association (HTA) President Bob Martin and supporters staged an anti-Term Limit Extension Rally in front of City Hall, Sunday, September 28th.